I have been using the Internet as a communication tool since 1986, and have been authoring World Wide Web (WWW) sites since 1994. I have been administering private WWW sites for myself and others since 1996. I have a strong technical background in most popular UNIX operating systems (Solaris, Linux, HPUX, etc), MacOS X, and Windows operating systems. I am able to effectively communicate technical concepts & information. Together these skills have made me able to deliver engaging and effective training as well as conduct customer and press briefings that delve into detailed technical discussions. In my leisure time I run a successful WWW site for an internationally known band, I am a published photographer, and dabble with sustainable off-grid electrical systems. 2003 - 2009 • Sun Microsystems, Inc.
From 2003 through 2009 the major milestones I owned were the design and shipment of Sun Java System Web Server 6.1 and 7.0 (including a complete re-design of the administration tools), Sun Java System Web Proxy Server 4.0, and shepherding Sun’s development efforts into colaboration with the Apache HTTPd server community into the creation of the Sun Web Stack collection of "AMP" software. I also ended the life cycles of older product versions and the product life of servers Sun was no longer committed to. Occupied a dual role as Product Manager and Junior Developer for Netscape Enterprise Server (NES) 6.0 and 6.1 releases. Worked closely with QA and Documentation to develop test suites and product documentation. 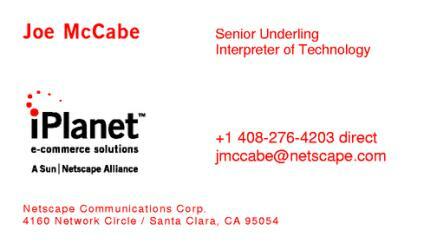 Responsible for leading the sustaining effort for the Netscape Enterprise Server (NES) and iPlanet Web Server (iWS). Tasks included planning and delivering service pack releases & patches, acting as primary technical representative for key customer meetings and security alerts, and representing engineering to internal customers, professional services, technical support, sales, and others. Secondary responsibilities included supporting product reviews, benchmarking efforts, delivery of Transfer Of Information (TOI) presentations, and trade show technical representation of the NES/iWS product. Advanced Support Engineers (ASEs) provided technical and personal backup for Netscape’s Technical Support Engineers on specific server products; Enterprise Server, Directory Server, Certificate Server, and Compass Server. 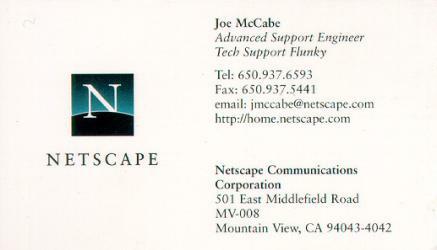 My technical background and customer skills were used by the world-wide Netscape Customer Satisfaction organization. I assisted with problem resolution, new-hire mentoring, training, on-site customer visits, etc. 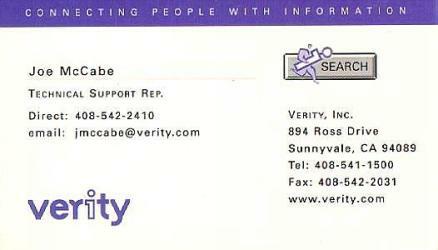 I provided help to Verity’s customers to install, administer, and maintain Verity’s Search97 family of search software. This involved maintaining a working knowledge of several operating systems, including Solaris, WindowsNT, Windows95, MacOS, and HPUX, and more. It also required a working knowledge of Verity’s proprietary scripting language, SearchScript, as well as HTML, CGI, NSAPI, ISAPI, and other WWW oriented technologies. 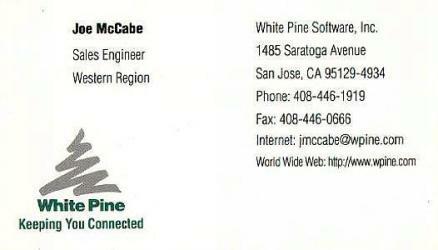 As the Sales Engineer for the White Pine’s Western Region, I had a wide range of responsibilities: attending trade shows as booth staff, performing on-site presentations for prospective corporate customers, on-site technical training and sales training to large channel resellers, providing pre-sales technical support to customers, training White Pine sales staff in the use of White Pine’s products, and conducting monthly training meetings with them to keep them abreast of changes in the technology. I also continued to be a technical resource for White Pine’s Technical Support Group and IT department. My responsibilities included: communicating with prospective and established customers to resolve technical issues; providing in-house MacOS support to software engineers, QA engineers, and other support representatives; providing IS services; creating and updating customer support database used by entire support organization; and updating & maintaining the Technical Support pages on the WWW. System Administration, Web Programming, Beginning and Intermediate C Programming, and more classes from the Santa Cruz Extension and De Anza College.